Ever since I decided at age 14 that I wanted to be a writer, I have held an image in my mind’s eye of a cabin in the woods, shut off from the rest of the world where I could work uninterrupted. In my 20s, when I first started camping with my husband and discovered I had a profound love of nature (and an equally profound fear of bears), the image still did not falter. In my 30s, I resigned myself to considering it a retirement perk. Now, in my 40s, I have developed a new outlook that has helped me learn at last that nothing happens in this life unless you make it happen. 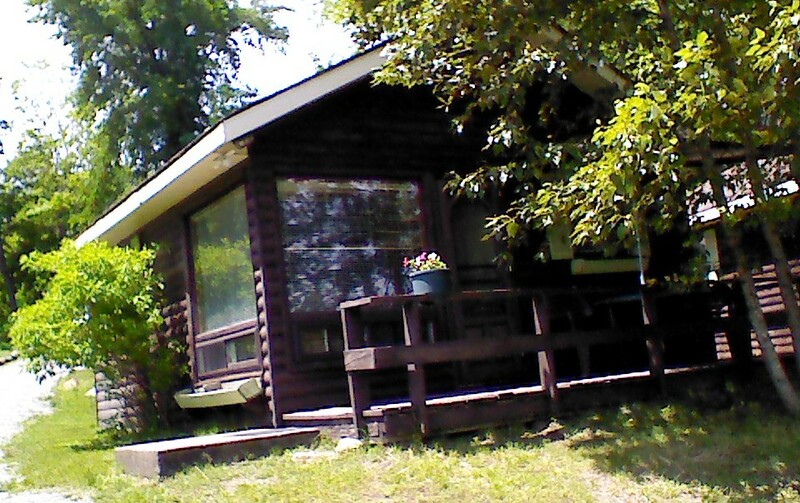 My “cabin in the woods” at Ogopogo Resort in Minden, Ontario. So, a couple of weeks ago, I packed up my car, kissed my husband and son while they slept, and hit the road at dawn. Music blaring, beer on ice in the trunk, chain smoking all the way (shut up, I’m going to quit), I drove north for three hours. Originally, I was supposed to stay at a trailer in a nature reserve owned by a friend’s mom and step-dad. It only cost $15/night and had everything I was looking for – a roof over my head, solitude, a lake, a fire pit and electricity (for my laptop). I had been planning this trip for five months and the weekend was confirmed. But, as it turns out, it wasn’t. Due to family communication issues, her parents had decided to go that weekend after all, and I could just have to find somewhere else to stay. A quick call to the registration office of the nature reserve garnered assurances that they had lots of accommodations available. And they did. What looked like army barracks overlooking the parking lot and heavy machinery, the accommodations were comfortable enough, but there was no fire pit, no lake and absolutely no peace and quite, let alone solitude. All for the low, low price of $70/night. I admit it: I had a tiny screaming fit in my car out of sheer frustration and deep disappointment. I considered buying a tent to camp out, then I realized that there would be no electricity and nowhere comfortable to sit so I could write. Plus, I had not packed for camping. I had no camp stove and no rope to hang my food out of the reach of bears. Rather than panicking and falling into despair, I sent a text message to my friend, whose husband got on Google and sent me two phone numbers to try. One of them paid off. 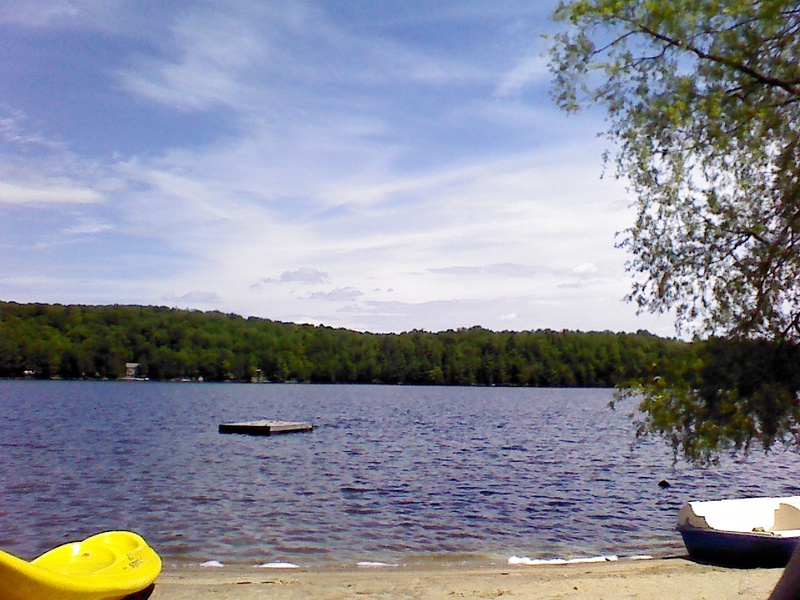 I landed at a lovely little resort on a lovely little lake – way more posh than Plan A – and it was nothing short of wonderful. Yes, it was an unexpected expense, but it wasn’t outrageous and that’s what credit cards are for. And, no, it wasn’t as solitary as originally anticipated. Well, at first it was, then on Friday evening a large family spanning three (maybe four) generations arrived. There were anywhere between 10 and 15 of them – they never stood still long enough for a proper headcount – and they spread out quickly over the resort grounds, playing baseball, checking out the beach and firing up the grill. But, it was okay. That’s what ear buds are for, and, honestly, they were a pleasure to observe, a huge, happy family laughing and playing and loving each others’ company. I got a ton of writing done in beautiful surroundings. The setting was not as isolated or vision-questy as originally planned, but nonetheless, I managed to get lost in a world of my own invention. In retrospect, I’m not precisely sure what held me back from that dream for close to 30 (?!) years. However, I am sure that I will be doing it again next year. Oh yeah. It’s on.